Most restaurant meals are designed to be filling and satisfying. That, after all, is how restaurants fill tables. For that reason, restaurant meals tend to be high in calories and filled with good-tasting ingredients that might not be all that healthy. 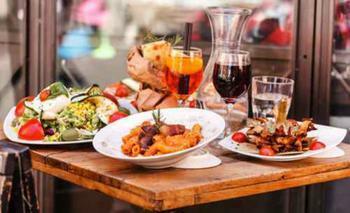 For those trying to eat a healthier diet, choosing a restaurant can be a frustrating process. The healthier choice might not be obvious at first glance. For example, researchers at the University of South Carolina say the caloric content of fast casual restaurants like Chipotle and Panera Bread is often higher than at fast food outlets like McDonald's and Burger King, even though the latter has a reputation for calorie-laden meals. Their findings, written up in the Journal of the Academy of Nutrition and Dietetics, reports an average fast casual meal has 200 more calories than a typical fast food meal. When it comes to menus, the study found more high-calorie options at fast casual establishments than the fast food restaurants. "We were surprised that there were higher calories at fast casual restaurants, but one of the main takeaways from the paper is that there are a lot of high-calorie options at both kinds of restaurants," said lead researcher Danielle Schoffman. The South Carolina study reached much the same conclusion as one at Tufts University in January. That study, which focused on fast casual and independent restaurants, found 92% of the 364 measured restaurant meals from both categories had more calories than the recommended number for a single meal. In a third of the restaurants, at least one meal on the menu packed more calories than a person should consume in a single 24-hour period. If you are maintaining a healthy diet at home, is it possible to eat in a restaurant without packing on the pounds? Most nutritionists will tell you that one restaurant meal will not kill a diet, and a treat every once in a while might not be a bad thing. It becomes a problem when restaurant meals are a staple of your weekly diet. For example, traveling for an extended period will require you to exercise some discretion and self-control. For starters, choose restaurants that post calorie information on the menu, and use that information when choosing what to order. Some fast casual chains, like Applebees, highlight items on the menu that have fewer calories and less saturated fat. Also, use common sense when selecting food. Weigh calories against nutritional content. Researcher Brie Turner-McGrievy says that sometimes the higher calorie meal is the better choice if it is more nutritious. "A burger on a white bun may have fewer calories, but when you're talking about cancer prevention or other chronic diseases, you have to look beyond calories," Turner-McGrievy said. "We don't want the message to be, 'Go eat hamburgers and don't eat guacamole and beans and brown rice.' "
Portion control: is it the key to weight loss?